This beautiful Destin Florida beachfront vacation rental home at Mainsail Condos is in gated community with security 24/7. 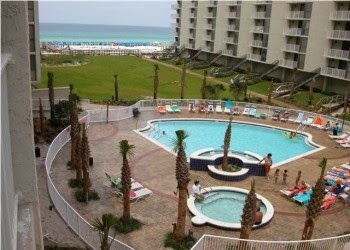 Fully Furnished and ready to move in or rent to vacationers. This 1460 sq ft condo has 2 masters with King size beds, a kids room with 2 sets of bunk beds twin over full, and a queen sleeper sofa to comfortably sleep 10 to 12 people. Steady rental for last 7 yrs. Convenient to everything. Across the street from Silver Sands Outlet Mall. 15 acre property with only 200 units. Financially sound homeowners association. Private steps to the balcony from the beach-walk. Please call for questions about the unit at Mainsail Condominiums. Plan a Destin Florida Vacation this summer!